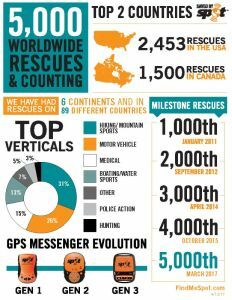 Globalstar Canada Satellite Co., a wholly owned subsidiary of Globalstar Inc. (NYSE:GSAT) and a leader in satellite messaging and emergency notification technologies, announced today that its SPOT family of products has surpassed the milestone of initiating 5,000 rescues since its launch in 2007. These rescues have taken place on six continents and in over 89 countries. 30% of SPOT rescues around the world have been initiated in Canada (1,500 rescues and counting). There are more than 65,000 SPOT customers in Canada who use the technology for recreational and business applications, including compliance with lone worker safety legislation and minimizing the risks for employees working in remote areas. According to the National Search and Rescue Secretariat, Canada is comprised of 18 million square kilometres of land and water1. This area covers 243,800 kilometres of coastline, 3 oceans and 3 million lakes including the Great Lakes and the St. Lawrence River system. With one of the world's largest areas of responsibility for search and rescue, there are 8 million square kilometres in Canada which fall outside the reach of traditional cellular and GSM networks2. Recent worldwide rescues initiated with SPOT include a woman in Canada who was involved in a snowmobile accident and was airlifted after suffering severe injuries; a lone worker in the U.S. who pressed the SOS button on SPOT after suffering from a seizure while on a logging job site; and a man in Switzerland who was transported to a hospital via helicopter after a skiing accident. More stories from some of the thousands of rescues initiated by SPOT are available online, searchable by region. The centerpiece of the SPOT family is the award-winning SPOT Gen3™, a global, satellite GPS messenger that provides on or off-the-cellular-grid messaging, emergency alerts, and GPS tracking. SPOT Trace™ is a theft-alert satellite device that can track anything, anytime, anywhere including cars, snowmobiles, boats or other valuable gear. For more information on SPOT Gen3 and SPOT Trace, including pricing, promotions and dealer locator, visit FindMeSPOT.ca. 2Source: This stat was calculated based on the CRTC's estimate that cell coverage extends to 20% of Canada and that Canada's total land mass is 9.98 million square kilometers. CRTC report, section 5.5 "Wireless networks cover approximately 20% of Canada's geographic land mass"